Although we like to think we move fast, the list of great ideas, needed features and new ways to look at data continues to grow. So, today we're giving developers outside our little team the tools to help extend Google Docs using the Google Gadgets platform. Developers now have an easy way to both add features to Google Docs (in spreadsheets to start) and to pull collaborative data from Google Docs into gadgets on iGoogle and other platforms. We joined forces with the Google Visualization team from our Tel Aviv office, who developed a common data delivery method, starting with data from our spreadsheets. This combines simple collaborative data management using spreadsheets with the simple customization and syndication platform of Google Gadgets. 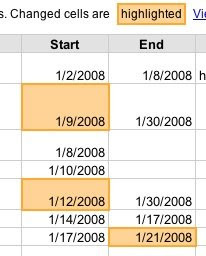 Imagine taking that project plan spreadsheet (yes, a wedding plan works too), adding a custom timeline chart, and then letting your partner (or fiancé) clearly see the plan's progress on their iGoogle page. How better to let them know that you'll be late on your project (or late to your own wedding)? This is really an exciting feature for us, as it gives spreadsheet collaborators more than a dozen new ways to look at their data -- including animated charts from the Google Finance and Trendalyzer teams as well as Pivot tables, Funnel charts and Gantt charts from a few of our beta developer collaborators (Panorama, Infosoft Global and Viewpath, respectively). And that's really just the beginning... so don't stop asking for more. And, there is more in this release. As with many things in life, once we have a taste of something good, we want more. From the time we began providing collaborative editing on the same spreadsheet at the same time, we started hearing that people wanted to know who changed what -- after all, you can't be expected to always be online to watch as edits are happening. You can also thank Marin Silic for column-based auto-complete, which takes cues for what you might be thinking from the data above and below your current cell. And thank him again for our updated color palette and function editing using the arrow keys. Function auto-complete comes in this release too, thanks to Kasem Marifet's part-time help. Our friend from the DocList team, Janani Ravi, also chipped in to bring us historical stock market data in the GoogleFinance function. And last but not least, John Danaher, one of our original engineers on the spreadsheets team, gives us a very interesting innovation this month in the Sort(), Filter() and Unique() functions. If you already use spreadsheets, you can imagine what those do. If you don't yet use spreadsheets, we think these and the other changes described are reason enough to start.